Now Deborah, a prophet, the wife of Lappidoth, was leading Israel at that time. Twenty years is a long time. For twenty years the Israelites had been slaves of a foreign king. This King Jabin and his army commander, Sisera, treated the Israelites very badly; but then the Lord sent Deborah to rescue the Israelites. Deborah, you have served me well as a judge for the Israelites. You have been wise in deciding their problems. Now I have another task for you. Call the man, Barak, to come see you and tell him my words. Yes, Lord, I will do as you have asked. Deborah obeys God and sends for Barak. Barak, the Lord, the God of Israel, is giving you a command. He says you must take 10,000 men with you to go to Mount Tabor. The Lord will draw Sisera into a trap. The Lord will bring him, his 900 chariots, and his troops to a river. There the Lord will hand him over to you. But, Deborah, Sisera and his army are so much stronger than all of the Israelites. We don't have 900 chariots. If you go with me, I'll go. But if you don't go with me, I won't go. All right. I'll go with you. But because of the way you are doing this, you won't receive any honor. The Lord will hand Sisera over to a woman. I will go get 10,000 men to go with us. Barak assembles the men and reports back to Deborah. We are ready to fight, Deborah. Go! Today the Lord will hand Sisera over to you. Hasn't the Lord gone ahead of you? My men and I will go now to fight Sisera for the Lord. As Barak and his soldiers march toward Sisera's army, something surprising happens. Look, Sisera's chariots and men are scattering. Chase them, men. Sisera has left his own chariot. He has run away on foot. He can't get far without his chariot. Find him. Barak chases Sisera. In his search he sees a woman sitting in front of her tent. You, there, by the tent. Who are you? I am Jael, the wife of Heber the Kenite, a brother-in-law of Moses. Come in my tent. I'll show you the man you are looking for. Do you know who this man is? He is the commander of the army that has enslaved the Israelites for 20 years. You have killed Sisera, enemy of the Lord and enemy of Israel. 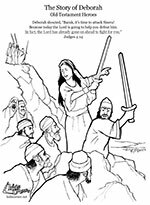 When Deborah hears that Sisera is dead, she leads the Israelite celebration. Praise the Lord. Kings came and fought. The kings of Canaan fought, but they didn't carry anything away. From the heavens, the stars fought. From the sky they fought against Sisera. The hooves of the horses pounded like thunder. The powerful horses of our enemies galloped away. May Jael be the most blessed woman of all. Lord, may all of your enemies be destroyed. But may those who love you be like the morning sun. Praise the Lord. If you want to read more about the times that the Lord saved the Israelites from foreign kings and from themselves, check out the book of Judges in the Old Testament part of the Bible.